Finn (John Boyega) and Rey (Daisy Ridley) in one of many BFF moments from The Force Awakens. Star Wars: The Last Jedi might have ended with Rey and Finn hugging it out after spending the entire movie apart, but I’ve remained afraid that something would drive them apart again. Luckily, we can all rest easy. John Boyega has confirmed that the rebellious duo are stuck like glue from here on out. “I haven’t read the script for Episode IX. But Daisy did shoot me a text saying, “Oh my gosh, I just heard from J.J., and we’re back together. 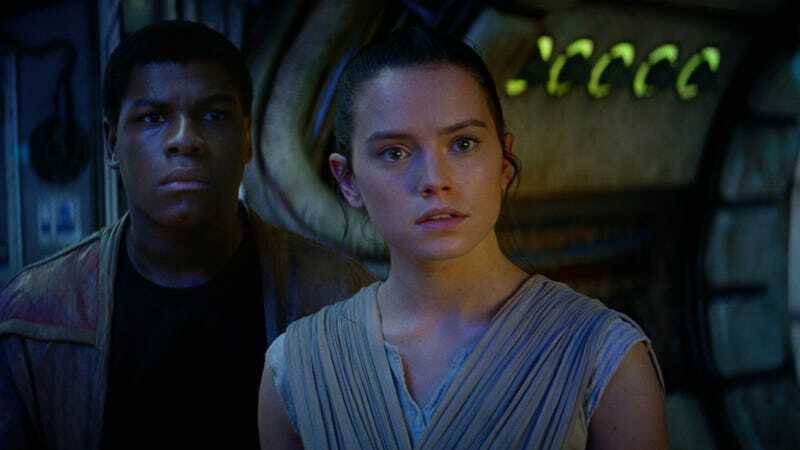 That’s what I’m really excited about, is Finn and Rey back together again,” Boyega said. Though the film which ultimately kept them separated (almost entirely), Finn asked about Rey immediately after waking up and toward the end of the film, Rey asked Chewie to pass along a message to him as she was headed off on a very dangerous mission. Given how Boyega and Ridley’s characters spent most of The Force Awakens together, with the actors bonding as a result, I’m sure they’re both thrilled to be working together again. Now, all we need is to bring Poe (Oscar Issac) back in to the dynamic trio. Because then I’d be allowed to use this GIF with every single Star Wars post for the rest of time. Hey bosses, that’s cool, right? That’s from the excellent blooper reel, by the way. If you haven’t already watched you can do so here. Star Wars: Episode IX has a release date of December 20, 2019.